Do we really need a recipe for a soul-satisfying mix of sausage and beans and tomato? Well, of course not! 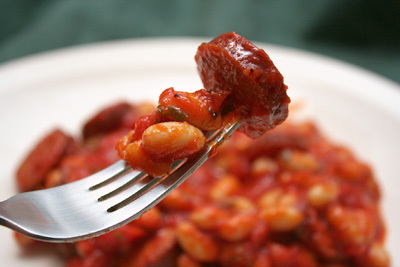 But the straightforward recipe for “Butter Beans with Tomato & Chorizo,” from Stone Soup, is inspiration enough to get your five ingredients together and please your hungry crowd. I doubled the given recipe, in order to feed three people. A recipe as pared-down as this is -- of course -- as good as your chorizo. I used Garrett County pork chorizo, which was smoky and snappy. I browned my coin slices in 8 minutes. The recipe calls out for butter beans (which are lima beans). But use anything! I was pleased with canned Great Northern beans. This all-too-simple recipe cries out for a family to eat it. I also made a spectacular, unfussy casserole that showcased leek, broccoli, and zucchini. The “Green Vegetable Gratin with Crunchy Carrot Crust,” from Veggie Num Num, was creamy, lovely, and easy to eat in big scoopfuls. The recipe is presented as a vegan dish, but I went ahead and used cow’s milk instead of rice milk and added 1/4 cup feta cheese to the carrot-almond topping. I used 9 oz. frozen broccoli without a problem. And instead of dry white wine, I used a mix of dry vermouth and fruit juice. I was quite charmed by this recipe’s topping mix. My carrots were not orange, simply because I used stunningly sweet, pale carrots called “white satin.” This mix of bread cubes, carrots, almonds, parsley, and feta was so right-on. As I simmered the vegetables, I enjoyed the sweet scent of the leeks and vermouth. I added 1 1/2 tsp. kosher salt and 1/2 tsp. black pepper to the vegetable pot. I felt so savvy to then remove the cooked vegetables and use that cooking broth for the sauce. The white sauce was a smooth and velvety triumph. I added another 1 tsp. kosher salt to the final sauce. After 20 minutes of baking, I did indeed increase my oven temperature to broil for another 5 minutes-- and I achieved my crispy top. This recipe is too smart and too wonderful to pass up. Do try it and be happy. Next time, I’ll take both a spicy and a sweet spin. 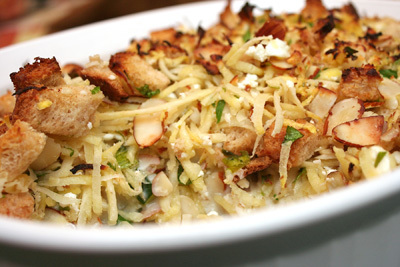 I want to try the “Curry Noodles in Coconut Milk Broth,” as showcased at veggiebelly.com. Then, I’ll turn sweeter with a dessert: “Canada’s Cake,” from thedailyspud.com. Get ready for this craziness, when you come back to my site on Thursday, December 2.